The Amazon Mobile Ad Network (AMAN) is offering a limited time opportunity to double your worldwide August iOS ad earnings. Simply send the first ad request from qualifying new iOS apps* starting June 13th, 2016. Earnings on qualifying banner and interstitial impressions* served on iOS devices in all supported markets (US, UK, Germany, France, Spain, Italy, and Japan) will be doubled up to $10,000 per developer. If your qualifying iOS apps generate $10,000 in global ad earnings in August, AMAN will match your earning with an additional $10,000 in promotional earnings so you receive $20,000. Why Use the Amazon Mobile Ad Network (AMAN)? AMAN serves unique high-quality ads from Amazon and brand advertisers on iOS, Android, and Fire OS phones and tablets. See how these developers increased their ad earnings with AMAN. 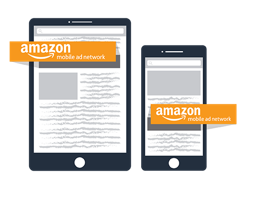 Integrate the Amazon Mobile Ad Network iOS SDK into your app. Send the first ad request on or after June 13, 2016. See your iOS earnings doubled on the Mobile Ads Performance Reports! * Existing apps already sending ad requests do not qualify. Apps that integrate the Amazon Mobile Ad Network SDK for the first time are eligible for the offer. Developers working with an Amazon Mobile Ad Network Account Manager do not qualify. Click here to learn more. Share this post using hashtag #AMAN. You spoke and we listened. We are excited to announce the launch of the Amazon Mobile Ad Network (AMAN) Adapter for MoPub. If you use MoPub to manage your ad monetization, it is now easier to add the Amazon Mobile Ad Network (AMAN) to your portfolio. This is a custom adapter that is solely supported by Amazon. Please contact Amazon for any questions. A great way to increase your ad earning is to partner with multiple ad networks. Ad mediation services such as MoPub help you request ads from networks that provide the highest eCPM (earning per thousand impressions) to maximize your earning, and the new adaptor builds compatibility between the AMAN SDK and the MoPub SDK. AMAN serves displaying ads to iOS and Android apps in the US, EU and Japan. See how these developers increased their ad earning using AMAN. Integrating and updating the Amazon Mobile Ads API in Android Studio just got easier with the API release on JCenter. Jcenter is a popular repository of build-artifacts that can be integrated directly within Google’s Android Studio and the Gradle open source build automation system. If you develop your app using Android Studio, you can integrate the Amazon Mobile Ads API by adding just a few lines of code and set up your build.gradle file so it is always on the latest version of the SDK. The Amazon Mobile Ads API helps monetize apps and games on Android, iOS, and Fire OS phones and tablets. The network serves highly relevant ads from Amazon and other brand advertisers in the US, Europe, and Japan. Create an Amazon developer account here. In Android Studio, insert the following single line of code in your build.gradle file to download and integrate the Amazon Mobile Ads API.